(MENAFN - GetNews) Javelin Services, Ltd hosts a series of JavTalks with the first series topic covering the science of pest control and how to protect your brand. 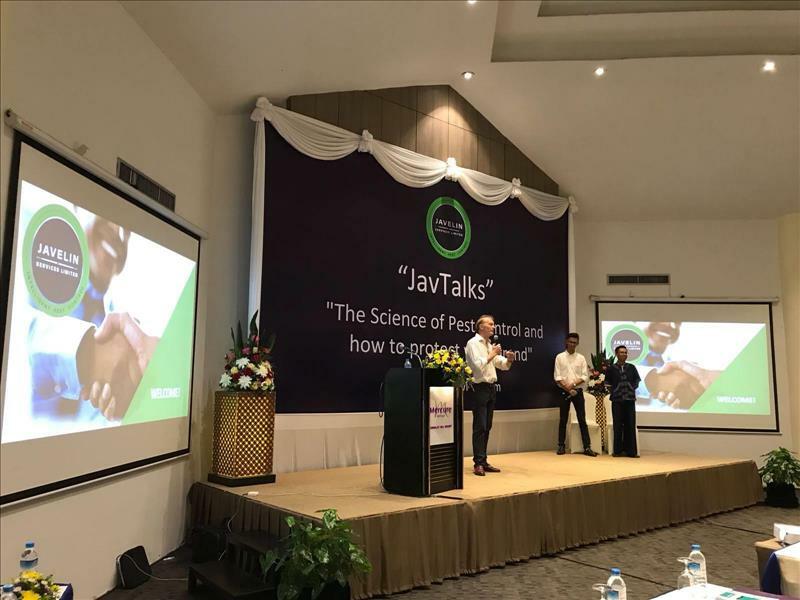 November 8, 2018 - Myanmar - Javelin Services Ltd, the British pest control company , embedded in British Pest ControlAssociation (BPCA) best practices, that launched in Myanmar in 2015 and is headquarteredin Yangon, held their first JavTalks seminar in Mandalay on Wednesday 31 st October at theconference center of the Mercure Mandalay Hill. The title of the seminar was 'The Science of Pest Control and how to protect your brand.Chairman and co-founder, Rupert Trotter opened the seminar with a session on effectiveteamwork in pest control and the responsibilities of both the pest control operator and theclient. It predominantly centered around the shape of proper pest control (in short,Integrated Pest Control Management or IPM) and actually how much of its efficacy isdirectly related to the removal of harbourage, water, and food from sites and carrying outbest hygiene and proofing practices.Additionally, the seminar focussed on the environmentally sane use of public healthchemicals but underscored that the use of chemicals was a last resort. Detailed presentations were given by both Jack Arkwright, co-founder and CEO andMuhammad Zaini Bin Abd Rashid, Javelin's in-house entomologist and former 20 yearveteran of the pesticide division of the German chemical company, Bayer Chemical. The whole seminar delivered the best practice framework of how pest control companies andclients need to work together to effectively solve pest issues and at the same time was longon science and the entomology and biology of pests. There we dedicated sessions onrodents, ants, cockroaches, mosquitoes, and termites.The seminar was well attended, by representatives from the hotel industry mainly, but alsosupermarkets, restaurants, manufacturing, and industry. Javelin Services, Ltd has physical bases in Yangon, Mandalay, Ngapali, Bagan and Nyaung Shwe and arelooking to deepen their countrywide penetration over the next 12 months.